Planning a nursery is an exciting time for parents, but it can be confusing without the right guidance. 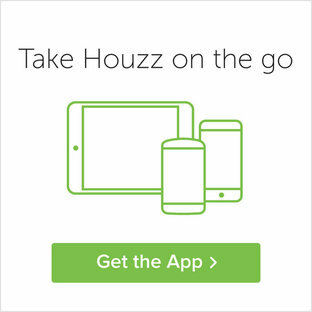 Houzz is a great place to start, as you can browse our extensive image gallery of nursery designs, as well as find qualified Kids & Nursery Designers who can help make your ideas a reality. We’ve put together some handy tips so you can get inspired and plan the baby room of your dreams. Which Essential Elements Should a Baby Room Have? When browsing through pictures of nurseries on Houzz, you’ll notice a common theme: They usually all include similar pieces of furniture and decor. You can’t go past a cot, changing table and a dresser. Whatever you’re after, you’ll be sure to find something for your taste, even if you’re limited by a small space or need to make it work on a budget. Another aspect to remember is practicality. You want to make sure you have enough storage so you can have a clutter (and trip-hazard!) free space, and you want to have everything within easy reach when it comes to changing nappies so you don’t risk your baby rolling off the change table while you turn around reaching for the baby wipes. Think about practical furniture: closets without doors, open shelves and furniture and walls that are easy to clean should be your go-to’s. Choosing colours is a big one. 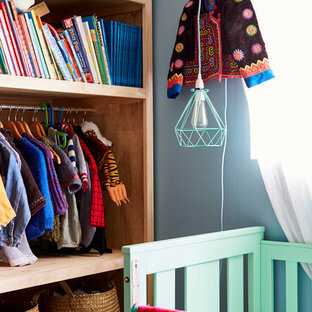 These days, you’re not limited to blue for a baby boy or pink for a baby girl - a lot of nurseries are actually held gender-neutral and you may be decorating without knowing the gender. Unisex colours are on the rise, as well as feature walls with inspirational artwork and themes that encourage exploration. The possibilities are endless - whether you go for a travel theme with clouds, a nature environment with mountains and trees, or animals like elephants or owls to tell your little one good night, you’ll be able to find wallpapers, decals and decorations to suit. Also consider a nice, soft rug for when your baby starts crawling. Being able to create nighttime-like darkness, peace and quiet at anytime of day could be something you’ll be thankful for later if your baby doesn’t want to go to sleep when it’s bright and guests are around, so think about lighting and soundproofing. A pair of heavy curtains could do the trick, and if you add a cute nightlight you can evoke an even more peaceful mood. The temperature and humidity of the room can also be major factors when it comes to sleeptime - too hot, too cold, too humid or dry? Make sure you can easily regulate the room temperature and have warm blankets handy in winter. You may also want to invest in a dehumidifier or vaporiser - these may earn extra points for white noise, too! Keep in mind that a baby will not be a baby room for long - they grow fast! Depending on how long you keep your baby with you, you may not even have a separate room and directly jump to sharing with their sibling. 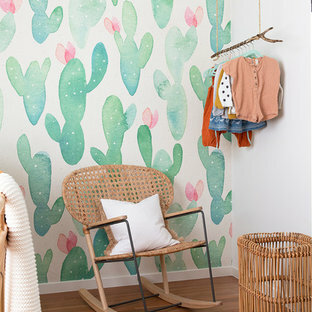 Keep in mind that you may be planning for a more grown-up kids room soon, and your baby doesn’t really care about the decor of the room as much as you do. Choose items you like and go for furniture that you’ll be able to move to different rooms later if you can. 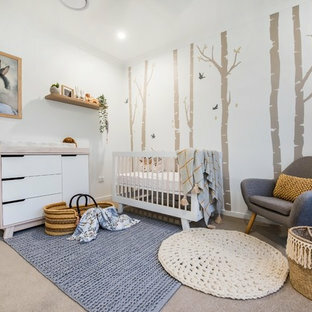 Photo of a mid-sized contemporary gender-neutral nursery in Melbourne with white walls, dark hardwood floors and black floor. Photo of a contemporary gender-neutral nursery in Canberra - Queanbeyan with grey walls, carpet and beige floor. 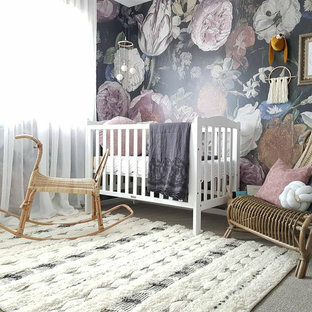 This is an example of a scandinavian gender-neutral nursery in Perth with grey walls, carpet and beige floor. 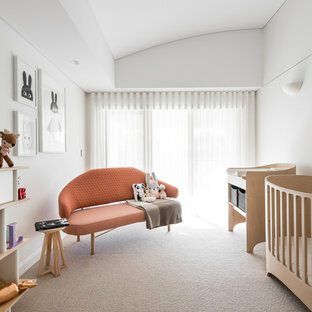 This is an example of a large contemporary gender-neutral nursery in Melbourne with white walls, carpet and grey floor. 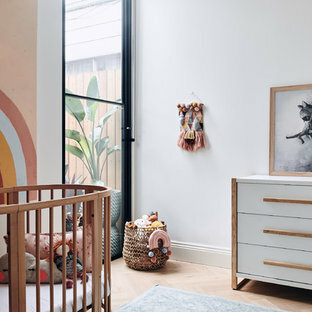 Photo of a contemporary nursery in Melbourne with white walls, light hardwood floors and beige floor. This is an example of a small contemporary gender-neutral nursery in Orange County with grey walls and grey floor. Inspiration for a transitional gender-neutral nursery in Chicago with white walls and medium hardwood floors. Design ideas for a mid-sized contemporary gender-neutral nursery in Los Angeles with blue walls. Photo of a transitional gender-neutral nursery in Toronto with carpet, beige floor and black walls. Traditional nursery in Houston with dark hardwood floors and grey floor for girls. Transitional nursery in Salt Lake City. Minimal boho nursery for baby boy. The interior is minimalistic with bohemian decors to make it more interesting. Wallpaper is from Livette's Wallpaper Scandinavian collection and the simple crib from Babyletto. Mid-sized transitional nursery in New York with medium hardwood floors for girls. By Nest Builders Development Co. This is an example of a traditional gender-neutral nursery in Richmond with grey walls, dark hardwood floors and brown floor. 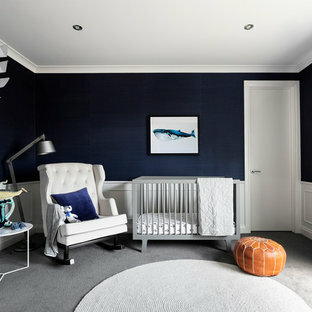 This is an example of a mid-sized transitional nursery for boys in Chicago with blue walls, carpet and white floor. This is an example of a mid-sized traditional nursery for girls in Ottawa.